There is an image of her where she sits in an auditorium. A lone figure with a notebook and a pen, she sits surrounded by rows of empty seats covered in shiny black leather. The picture tells much about Malala and her struggle: a vulnerable girl out on her own, holding on to her books like a talisman, drawing strength from her belief in the power of education. The empty seats suggest that the teenage female education activist is in a class of her own. But for a country that has the third-largest number of out-of-school female students in the world, they also suggest that Malala has a long struggle ahead of her to bring the missing girls to schools. Those expectations are going to multiply now that she has won the Nobel Peace Prize. But equally importantly it is the symbolism of the peace prize she shares with India’s Kailash Satyarthi for their work promoting children’s rights that shouldn’t be lost on Pakistan and India, say observers. For someone who has sharply divided the opinion on her relevance to Pakistani society, Malala has been lionized for her struggle for education in the face of murderous obscurantism and disparaged for “being co-opted by the West in its agenda to malign Pakistan.” As expected, the reaction to her winning the Nobel Peace Prize on Friday was just as discordant and polarized. “Reading negative comments about #Malala Yousafzai today, I realize she is like the Dark Knight, not the hero we deserve but the hero we need,” said a tweet on Friday, as the hashtag Malala Yousafzai trended on Twitter. For many in her hometown of Swat and Khyber Pakhtunkhwa province, the significance of a Pashtun girl wining the Nobel is clear. To them it is a historic event from which Malala Yousafzai has emerged, perhaps somewhat incongruously, as mythical a figure as Malalai of Maiwand, the Pashtun folk hero who rallied Pashtun fighters against the British troops during the second Anglo-Afghan War. Fakhar, who also taught at the Khushal School where Malala studied, said there was something special about her class. 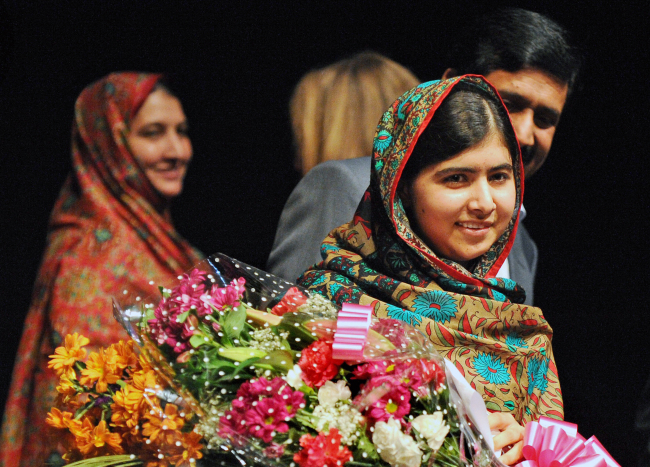 When the Nobel Prize for Peace was announced on Friday, Malala got the news at her school in Birmingham. She was in the chemistry class, a subject she loved, according to Fakhar. “She loved physics, chemistry, Islamic studies, but most of all she loved English because her father, who had studied literature, introduced her to it,” he said. And the subject she couldn’t stand?